Think about the NYT’s logic–The fact that a husband shot and killed his wife, then himself, in a state where it is extremely difficult to carry a gun for self-defense proves it is dangerous to make it easier to carry guns for self-defense in South Carolina. The argument is not congruent. NYT reminded everyone of the June 17, 2015 attack on innocents at Charleston’s Emmanuel A.M.E. Church, but did not mention that the churchgoers were unarmed nor did it explain why making it easier for law-abiding citizens to be armed for self-defense is misguided. Think about it–California has universal background checks, firearm registration, firearm confiscation laws, an “assault weapons” ban, a 10-day waiting period on gun purchases, and a “good cause” requirement for issuance of a concealed carry permit. The “good cause” requirement means law-abiding Californians are not allowed to carry guns for self-defense by birthright. Rather, they have to prove they have a good reason to carry a gun. This requirement has enabled anti-gun California politicians to keep the number of permits issued at about 80,000. That means only about 80,000 out of a population of more than 39 million Californians can legally carry a gun for self-defense. South Carolina does not want to end up in a similar situation, where the vast majority of law-abiding residents are not allowed to be armed in public for defense of themselves and their families. This may offer a possible hint to the findings of a separate investigation recently undertaken by researchers at the Federal Reserve Bank of New York. Analyzing consumer survey data collected by the Fed over the last few years, the research found that it is far harder to get a job when you are unemployed than when you are employed. “[E]ven though unemployed workers search about seven times as hard as the employed, they only generate about twice the number of offers. Thus, searching while unemployed is much less effective in generating offers than searching while on the job,” they write. Of course, if the job-searchers are suffering from depression and other signs of deteriorating mental health, it would make sense that employers are less likely to hire them. Compared to their employed peers, the unemployed would simply be less attractive hires. And, of course, it’s probably harder for unemployed men to find romantic success since one-in-five women say they won’t date a man who earns less than they do. So an unemployed man would be unattractive to both potential employers and mates. No wonder that is depressing. The federal government will test 20 different prototype border walls near San Diego this summer, according to a Tuesday report in the San Diego Union-Tribune. The test walls will be built in the Otay Mesa community alongside the existing border walls, once the most promising proposals are selected in June, according to the newspaper. Federal officials told the Associated Press that the prototype walls would be 30 feet high and 30 feet long, and will each cost between $200,000 to $500,000. Democrats in the Senate are blocking President Donald Trump’s border-wall funding request for $1 billion dollars by April 28. Top GOP leaders are not fighting the Democrats’ obstruction, but are promising to fund construction of the border wall from October onwards. DHS spokesman David Lapan said Tuesday that the agency is funding the test walls by transferring funds from other parts of the agency. The agency has permission from budget leaders in Congress to “reprogram” the existing funds, he said. The Pew Research Center released an analysis of Justice Department numbers Monday showing a massive increase in the prominence of immigration-related offenses in federal law enforcement. Pew cited a report released last month by the Bureau of Justice Statistics to show that immigration offenses accounted for fully half of federal arrests in 2014, up from only 28% a decade earlier. Consequently, the Department of Homeland Security, which includes Customs and Border Protection and Immigration and Customs Enforcement (ICE), now makes more arrests than the FBI, DEA, BATFE, U.S. Marshal’s Service, and all other branches of the Justice Department combined. The geographic distribution of federal arrests also shows the growing emphasis on immigration offenses. In 2014, 61% of all federal arrests – or more than 100,000 – occurred in just five federal judicial districts along the U.S.-Mexico border. Driven by this massive increase in immigration arrests, a staggering 61% of federal arrests are now of non-U.S. citizens. These arrests, mostly for immigration offenses, but including thousands for other crimes, do not include the hundreds of thousands of non-criminal apprehensions of illegal aliens each year. Illegal aliens made up an equally shocking 37% of all criminal defendants in federal district courts in 2014. Most illegal aliens arrested for immigration offenses are referred to administrative hearings before immigration courts. The increase in this type of arrests has placed tremendous strain on that system. The resulting backlog raises concerns of a “virtual amnesty” from the inability to process these cases. The BJS report shows that, increasingly, immigration offenses, which can include more serious crimes like trafficking aliens into the United States, are winding up in regular U.S. district courts. While, in 1994, fewer than 2,500 immigration cases wound up in district court, 21,789 did in 2014, representing over a quarter of those general courts’ criminal caseload. Of those defendants, almost 80% were sentenced to time in federal prison with a median sentence of 15 months. The influx of illegal alien offenders and especially of immigration arrestees remains a pressure point on the federal prison system that, due to a drop in other types of offenders and changes in federal sentencing policy, has otherwise seen a drop in overcrowding. The problem is particularly acute for prisons run by private companies, which are disproportionately set aside for immigration offenders. ICE is forced to make use of dozens of private facilities to house detainees awaiting deportation. Attorney General Jeff Sessions recently announced he would be reversing the Obama administration’s plans to phase out private prisons for criminal convicts and pre-trial detainees. Pew notes that, by their estimates, federal arrests make up only a little more than one percent of the total arrests in the United States each year, local and state law enforcement being responsible for the vast majority of arrests. While the numbers in the BJS report accurately reflect the federal criminal justice system, wider estimates of the proportions of crime committed by illegal aliens are hard to come by. Reporting across the nation’s hundreds of law enforcement agencies is inconsistent and incomplete. So-called “sanctuary” jurisdictions also refuse to report on their arrestees’ immigration status as a matter of policy, hindering federal efforts to collect statistics and enforce immigration laws. Maryland is the first state to pass a law that agrees to reimburse abortion chain Planned Parenthood if Congress passes, and President Donald Trump signs, legislation that eliminates its federal taxpayer funding. The Democrat-led general assembly passed the measure, and Republican Gov. Larry Hogan made the decision not to veto it. The bill provides for the state to direct $2 million from its Medicaid budget and $700,000 from its general fund to keep Maryland’s nine Planned Parenthood facilities in operation, reports CBS News, adding that nearly 25,000 people receive services at Planned Parenthood in the state. Opponents to the legislation cite that recent federal measures to eliminate Planned Parenthood’s taxpayer funding have also redirected those monies to other community healthcare centers that offer more expansive services. 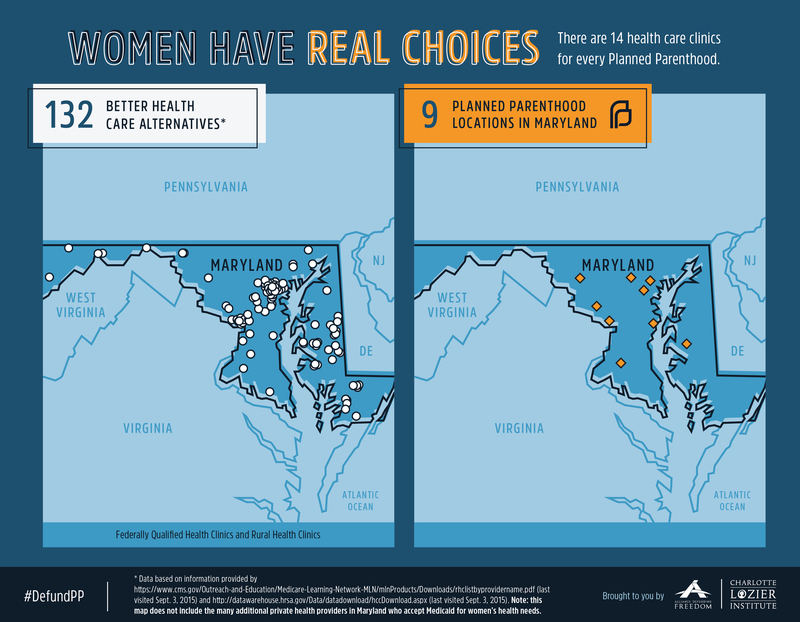 Charlotte Lozier Institute observes that, while there are only nine Planned Parenthood facilities in Maryland, there are 132 “better healthcare alternatives” in the state. Patients can find alternatives to Planned Parenthood at getyourcare.org, where they can enter the city, state, and proximity desired. Planned Parenthood has been under investigation since the summer of 2015 after undercover journalists exposed an alleged fetal tissue operation. The allegations that Planned Parenthood sells the body parts of aborted babies for a profit led to multiple congressional investigations. Ultimately, the Senate Judiciary Committee and the House Select Investigative Panel have referred Planned Parenthood Federation of America, several of the largest Planned Parenthood affiliates in the country, and three of their business associates in the fetal tissue procurement industry, to the FBI and U.S. Department of Justice for criminal prosecution. Planned Parenthood performs more than 300,000 abortions per year and receives an excess of a half-billion dollars annually in taxpayer funding. A recent Marist poll found that 61 percent of Americans oppose taxpayer funding of abortion, including 40 percent of those who say they are “pro-choice” and 41 percent of Democrats. President Donald Trump already appears to be getting results after his visit with Chinese President Xi Jinping. According to the Financial Times, China signaled that they are open to ending an import ban on American beef. They also signaled their willingness to buy other agricultural products, demonstrating a commitment to balancing the enormous trade deficit with the United States. The two countries are focusing on a 100-day effort to signal mutual trust on issues of trade, part of Trump’s commitment to voters during the election. After meeting with Chinese officials at Mar-a-lago last week, Treasury Secretary Steven Mnuchin appeared optimistic that a number of quick deals could be reached.